Last year’s first season of Voltron: Legendary Defender was a solid start for rebooting Voltron, and its second season is much the same in terms of fun, solid giant robot action. But it’s made even better by expanding its scope, telling richer stories, and focusing more on character development, which turns an already good series into something even better. For all intents and purposes, Voltron season two is a lot like the show’s first season—and that’s a good thing, because outside of a few relatively minor quibbles, Legendary Defender’s first crack was a great, slickly-made update to the ‘80s anime classic when it hit Netflix next year. With the benefit of having a solid introductory season out of the way, season two, which dropped on the streaming service this past Friday, didn’t need to reinvent itself or fix some grievous flaws. Instead, the show could use the small-scale stepping stone of its first season to catapult Legendary Defender into a much wider universe, one packed with exotic locales, great new characters, and a much bigger and deeper sense of place than its predecessor. It mainly gets to do this thanks to the first season’s frustrating cliffhanger from season one, which saw each of the five Paladins and their Lions suddenly scattered across unknown regions of space after a grim encounter with the villainous Emperor Zarkon. While this cliffhanger was indeed one of the rare negative points of the first season, it paid off—the first handful of episodes in season two all focus on reuniting the team so they can plan their next move, but it also means we’re treated to a whole different slew of alien locations and creatures the team encounters on their trek back to being a team again. It’s a sharp, sudden increase in scope for a show that was, previously, relatively narrowly focused on the Paladins, Voltron, Allura’s ship and pretty much nothing else. But the variety is dearly appreciated; not only does it lead to some fun adventures (and a mandatory shopping mall-in-space visit that is both a love letter to the series’ anime roots and one of the funniest episodes of the season) but it adds texture to the world of Voltron that was sorely lacking in the first season, even if you didn’t quite miss it because of all the sharp action and character interactions. Even though season one was about our heroes coming together and reconciling themselves with the task of being heroes at the vanguard of protecting the galaxy from evil, we didn’t really get to see that galaxy at all up until now—and now that we have, it actually makes Voltron feel like a defender of the universe. There’s a sudden increase in stakes that comes from simply being able to see the legions of worlds and species the team stands up in the name of protecting as the pilots of Voltron, a small but necessary step on their path to being heroes. It feels a lot, in a way, like Studio Mir’s previous big animated series, Legend of Korra, in its transition from the small focus on Republic City in its first season to the wider world Korra represents as the Avatar in season two and beyond. It also definitely helps that, like Korra and Avatar before it, it makes an already pretty fabulous looking show like Voltron look even better. The relatively simplistic arc of the season—reunite, and plan the next move to take out Zarkon and the Galra Empire for good—doesn’t just let the show have room to flourish in exploring new worlds, but refine and focus itself on advancing the main characters, too. The biggest beneficiary of this is Keith, who was little more than a cocksure ace in the first season that played second fiddle to Shiro’s leadership role. Legendary Defender season two acts as a sort of grooming period for Keith to take Shiro’s place as leader of the team by the end of the season, and in the process of doing so, reveals a much more interesting character behind the loud, brash mask he had in the first season. As season two progresses, Keith comes to terms with his eventual path to command as well as himself, discovering his part-Galra heritage and the fact that the conflict between Galra and the Paladins is not as black-and-white as he thought, slowly but surely transforming the character not just into a potential leader in the wake of Shiro’s cliffhanger disappearance in the climax of the season (a fun but different nod to Shiro’s much more permanent exit in GoLion, the anime the original Voltron series was adapted from), but one of the most fleshed out and interesting characters on the show. Keith also plays a major part in Allura’s growth in this season. While she’s not quite stepped up to the pilot she eventually became in the original Voltron, she slowly gets to develop beyond the typical princess role she’d fostered in season one—especially without the crutch of having her father’s A.I. aboard the Castle-ship to guide her—and step more into a pro-active role as part of the team. The revelation of Keith’s Galra heritage is also used to excellent effect for her arc, as she tries to reconcile the fact that not all Galra are as capable of evil as Zarkon and his forces, and that not all of her own people were as good and just as she is. In comparison to the focus on Keith and Shiro, her evolution is relatively minor, but it’s an important one as the show broadens its scope to at least introduce some moral complexity to its overarching conflict. Shiro, meanwhile, doesn’t dominate the storyline as he did last season, his relationship with Keith over the season reveals a much warmer side to the character beyond his mysterious connection to the Galra and the many—many—nods to his GoLion fate in the first season, even if it’s primarily through how Keith views him rather than through Shiro’s own journey himself. But while the show’s worldbuilding and characterization are better than ever, something has to give, and it’s the characters in the main cast who aren’t Keith, Shiro, or Allura that end up coming up short thanks to an increased focus on establishing a wider universe for Legendary Defender to play in. With main bulk of the character work being given over to Keith’s arc, and how that impacts his relationships with both Shiro and Allura, Hank, Lance, and Pidge barely get any moments to shine outside of a few goofy skits that lighten the mood in between some of the heavier moments surrounding Keith and Allura’s stories. This also, frustratingly, still applies to the Galra villains, too. Despite some key revelations about Zarkon’s history with the Voltron Lions and Haggar’s Altean ancestry that nicely play into the show’s increasing moral complexity, the two main villains largely remain as shallow and ineffective as they did in the first season. With the increased focus on the other characters being so strong, it makes them the absolute weakest aspect of the show going forward. It’s only because we ultimately end up caring about the heroes so much, and get to see a bigger universe, that the villains’ blandness doesn’t drag the whole season down. 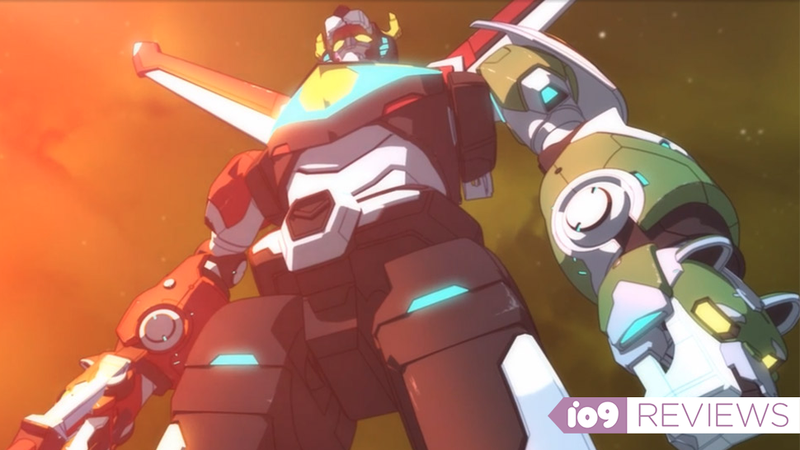 Although it got off to a slow start, Voltron: Legendary Defender has now well and truly hit its stride in season two to become a series that’s not just a worthy successor to the years of nostalgia behind the Voltron legacy, but one that’s confidently setting itself on a path to where it could eventually rival Studio Mir’s previous excellent track record in Legend of Korra and The Last Airbender. Voltron is back, bigger and better than ever, and I hope that’s a trend it intends to continue next season and beyond.